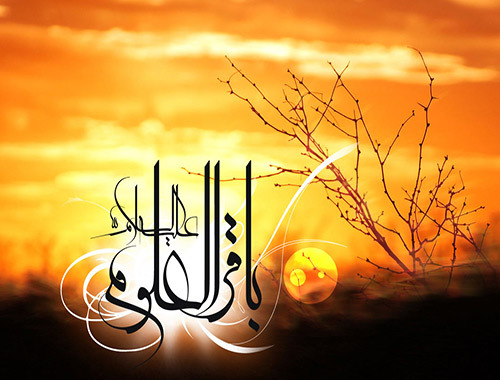 Imam Mohammad Baqir (Pbuh) was born on 1st of Rajab or 3rd of Safar, 57 A.H. in Medina. Both from mother and father side of the family, he was descended from Hazart-e Ali (Pbuh) and Fatemeh Zahra (peace be up on him). As Imam Sadiq (Pbuh) said, her dear mother was unique in Imam Hassan’s family. The period of Imam Mohammad Baqir (Pbuh)’s life is divided into two parts. The pre-Imamate part lasted for more than 35 years, which his father Hazrat-e Ali -Ibn-al-Hossain (Pbuh) was the leader. The second part of Imam’s life was the period of his leadership. In this period he founded his scientific government. For 50 years, that honorable man taught in the religious universities and revealed the religion’s truth for his students also told them about the hundred - year Islamic history, from the death of Hazrat-e Mohammad (peace be up on him) till his time. 1. Hazrat-e Mohammad (peace be up on him)’s narration about the introduction of the twelve Imams (Pbuh). 2. The special narration about Imam Mohammad Baqir (Pbuh) said by Hazrat-e Mohammad (Pbuh). 3. The Jabir Ibn- Abdollah Ansari’s testify about the prophet (peace be up on him)’s glad tidings for the birth of Imam Mohammad Baqir (Pbuh). 4. The Imam Sajad (Pbuh)’s certification about the Hazrat-e Baqir(Pbuh)’s Imamate. 5. The Hazrat’s speeches about himself and the Imamate’s continuance till the 12th Imam. At his time, for the Imam Hossein (Pbuh)’s rising and the pressure of the Omavid’s oppressive government, the pious Iranian people helped Banoabbas to uproot the weak reign of Banomayeh. Therefore, it brought a suitable opportunity for Imam Baqir (Pbuh) to improve and strengthen Shi’ite and to reject superstitions and to to struggle against the wrong methods of exertion of divine law. Any act, no matter how small and minimal, may as a matter of fact act as a long ladder in reaching Allah’s (the exalted) satisfaction. The same matter can be applied to our peers; a person whom we may have overlooked at all times may in fact be an eminent servant of Allah (the exalted). - He has hidden His satisfaction in His obedience; thus never undervalue an act of worship, lest His eventual satisfaction may be in that specific worship. - And finally, He has hidden His chosen people amongst His servants; thus never undervalue any of His servants, lest that person is in fact the selected." Why does Imam Baqir (A.S) insist upon making sure "no matter how small, acts of worship are not undervalued?" The fact of the matter is that Allah’s (the exalted) satisfaction lies in our obedience to Him; the value of an act depends upon its acceptance by Allah (the exalted), rather than our understanding of an act's importance. The concept of "an act being accepted by Allah (the exalted)" can be seen in prayers of the Prophets (peace be up on him) and the Imams (peace be up on him), where despite their well-known piety and faith, they would constantly ask Allah to accept their acts of worship. The same rule applies to sins, in that one should refrain from undervaluing any sin. Regardless the sin, in an act of sin a person is disobeying the commands of the authority of Allah (the exalted). For who knows, that same sin can be a start in the path of Allah’s (the exalted) dissatisfaction, and as a result lead to an unpleasant ending. However, Imam Baqir peace be up on him) does not limit his words to the acts of worship and sin, rather the Imam continues to discuss our interaction with people. How can one undervalue a brother/sister, while the great servants of Allah are hidden among the rest of the people? It is noteworthy that this saying does not specify a certain group of people such as the faithful; rather it encompasses all the creatures of Allah. Islam has not allowed us to judge people by their appearances, unless his/her true character has been revealed; and has not allowed us to ignore others merely because he/she does not have a pleasant appearance to us. Apparently, the main idea of this Hadith is that no act, whether good or bad, and no person should ever be undervalued. Nevertheless, considering the hard path in life, what view have we acquired toward the acts and people around us?